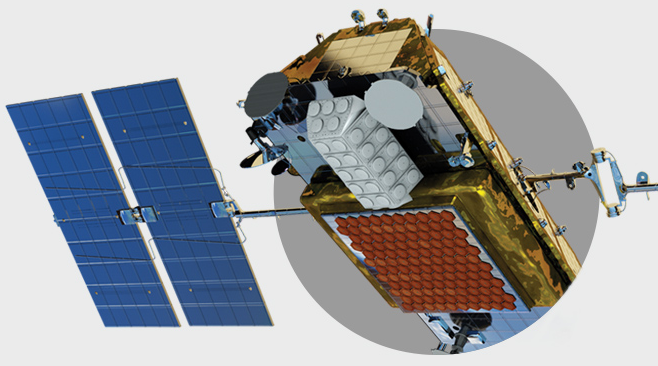 In its official website, Iridium describes itself as "the world's only truly global mobile satellite communications company." It offers global voice and data communications coverage. Is Iridium the only mobile satellite communications network that has polar orbits, and therefore has line-of-sight service to satellite telephones at the poles? As of today (October 2016), Iridium is the only public satcomm provider using a constellation of low earth orbit satellites with high inclination orbits to provide a service with global coverage. You can compare coverage easily on this website. Inmarsat and Thuraya in contrast use geostationary satellites, Thuraya uses spot beams to cover specific regions, while Inmarsat has wide beams. Globalstar uses low earth orbits, but the inclination of 52° does not allow to reach polar regions. Military may have additional non-public networks. A non-public LEO/MEO constellation would not go unnoticed, as more than 30 spacecraft are needed depending on orbital height (Iridium uses 66 plus spares), so all LEO and MEO constellations tend to be known. Iridium is the only such constellation with continuous coverage of polar regions. This makes it unlikely, that military has a non-public network with coverage and latency comparable to Iridium. As explained on the Wikipedia page (https://en.wikipedia.org/wiki/Iridium_satellite_constellation), Iridium constellation uses polar orbits. Those orbits are intended for a full "north-south" coverage. The downside of the Polar orbit is that each orbit has a shift in longitude. This issue is corrected by the use of 6 different polar orbits (equidistant) with each individual coverage overlapping the next one (see the GIF on the Wikipedia page). Not the answer you're looking for? Browse other questions tagged communication communication-satellite iridium or ask your own question. What are the regulatory steps to be taken by a private aerospace company in India to launch a satellite?